Everyone else was going to Rome; it got there at 7AM. I was the only person on the whole train who got off at Pisa. I didn't want to leave the station until it started to get light outside so I walked around and tried to sleep by the rails. At 4, since it was 10PM at home, I made a phone call ("you can't say no one ever called you from a payphone in Pisa at 4AM") and then slept until 5:30. The train station's bathrooms are literally a hole in the ground. They're the sort of thing Amnesty International would write letters about. 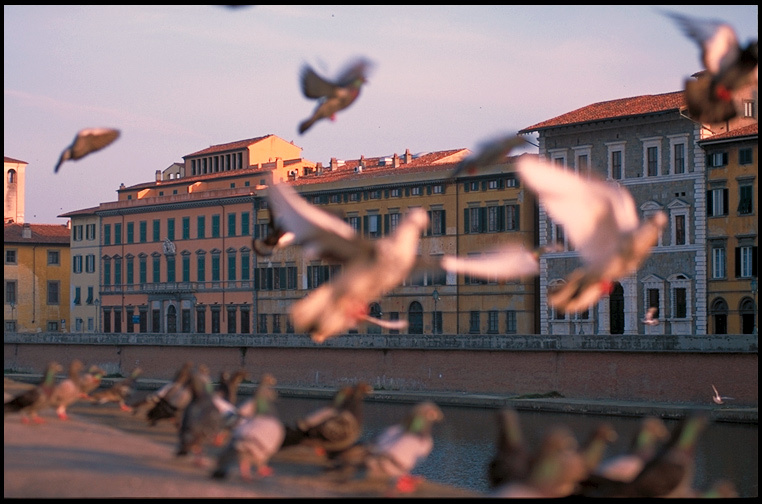 Pisa is a small town with a river that was pretty as the sun was rising. There are signs throughout the town with a symbol of a leaning tower and an arrow. I was somewhat embarrassed to follow them. I can imagine what the locals think: "It's a tower, it leans, OK? You know what it looks like already!" I stepped out from behind some buildings and there it was: it's a tower and it leans. It was somewhat anti-climactic. It's not an especially large tower. But it's good to see things like that for yourself. Maybe it was because of the early hour, but I half expected to walk around the corner and see nothing where my map said the tower was supposed to be. What if the leaning tower didn't exist at all? What if it was some kind of strange joke all visitors to Pisa buy into? Or maybe it was only a few feet tall. But no, it exists. It's a tower and it leans. If you look at it from some angles, it doesn't even appear to lean. It didn't open for another hour so I looked at it for a few minutes and caught the hour long train ride to Florence. First, if you go to Florence (Firenze), there are two train stations. 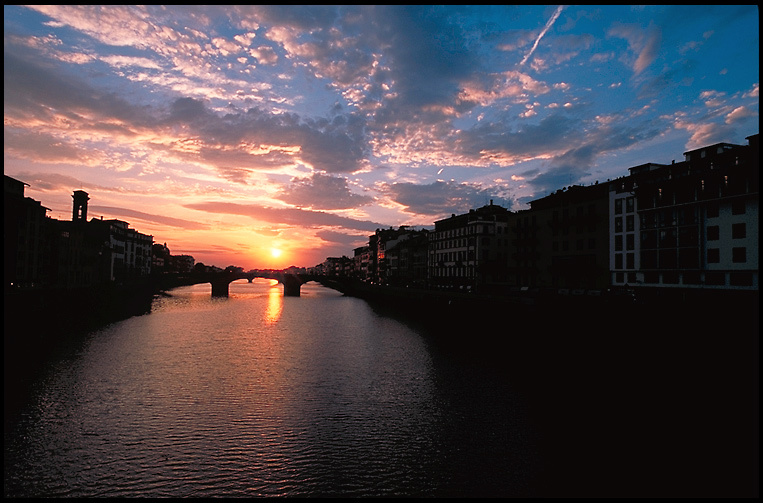 The one you want is Firenze SMN. All trains stop and turn around there. It's the Grand Central Station of Tuscany. Second, if you don't have a place to stay, there's a place in the train station near the exit that will find a hotel or pension for you. I walked around for over an hour finding 'completa' youth hostels before going back there. Florence is definitely more expensive than Spain, but I got a single room in a pension with a sink and a TV (for the World Cup) for a little more than it cost in Granada. My conversations with the older woman who owned the house consisted entirely of 'buon giorno', 'prego' (I think this means anything you want it to mean at the time), 'grazie', and 'si' from both her and I. Covered with distinctive red terra cotta tiles, Brunelleschi's dome (or Duomo / cathedral) is the centerpiece of Florence. 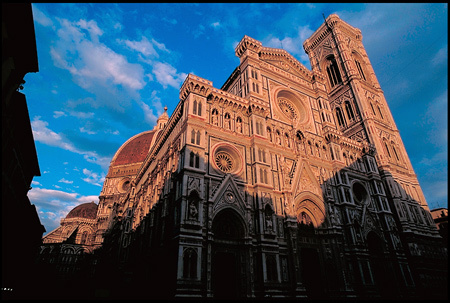 Built to complete the Santa Maria del Fiore, the dome was designed and construction overseen by a clockmaker, Filippo Brunelleschi, from 1420-1436. It was the largest dome of its time and remains the largest brick dome ever constructed. According to Ross King's Brunelleschi's Dome, it was the first such structure to be built without the use of buttresses or temporary wooden supports, relying instead on internal herringbone brick pattern and nine horizontal circles (perhaps inspired by Dante's nine concentric circles of paradise) that created rings which held the hoop stress of the dome. In the late 1540s, an aging Michelangelo walked up it using the staircases the builders used (they run between the inner and outer shell) to study the methods used before beginning work on his (arguably lesser) dome at St. Peter's. When the light got warmer in the afternoon, I, like Michelangelo (455 years earlier) went up it. It's definitely worth the climb to the top. How beautiful is Florence? During the middle of the day in the summer, it's hot, busy, crowded, and has few natural sights to see. (It has a lot of museums, such as the one which houses Michaelangelo's David, but it's no Granada for the non-museum/non- cathedral sights I like to photograph). But in the early morning and late evening, it's magical. 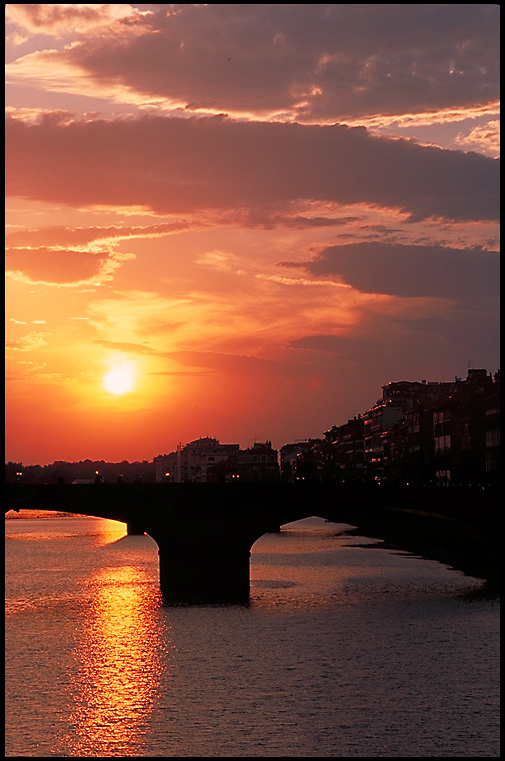 At sunset, find yourself a spot on the Ponte Vecchio bridge to watch it. Even Granada doesn't get much better than that. 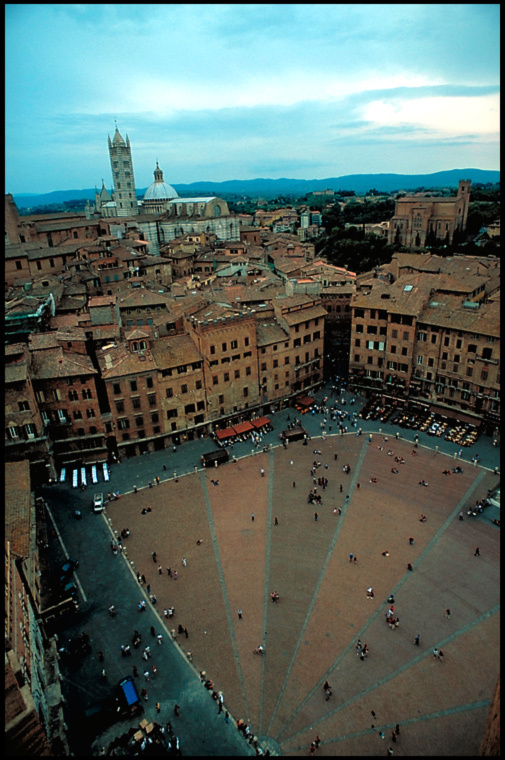 I took a noon train 60 kms / 2 hours south to Siena and then walked into the Piazza del Campo. 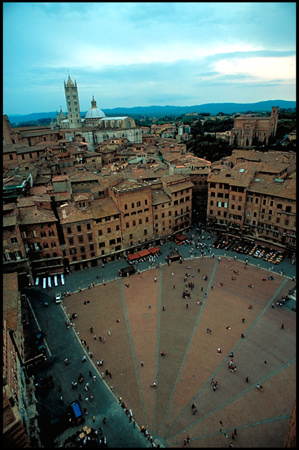 The Piazza is shaped like a shell, a semicircle with bricks laid in rays, the outer edges higher than the center. In the center is a tall tower with a clock by which you can tell perfect time despite its lack of a minute hand. Along the outside are brown umbrella- covered cafés. I sat by a post on the edge of the shell and read a Graham Greene novel I'd borrowed when I was in Nice and drank from a bottle of cheap Chianti I'd bought in Florence the night before. The square was busy and noisy at midday and I overheard some of the conversations. One little blonde girl chased pigeons around my feet as her younger sister cried and her mother yelled after her in a British accent. Graham Greene has long been my favorite writer so I was happy to lie there reading for hours waiting for the café crowds to thin. I had chosen a spot wisely that was covered by shadows as the afternoon passed and was soon also covered by crowds of people also seeking the shade. From my rough ear for languages, there seemed to be a lot of Germans around me. They wore sunglasses and smoked and one of them wore leather overalls. 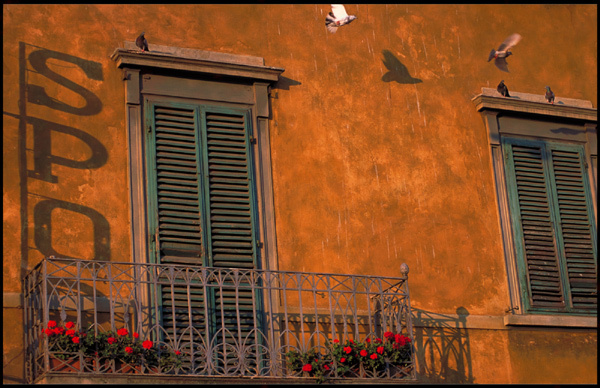 They came and went and I read the brown canopies around the square, half in English, half in Italian: self-service, pizzeria, restaurant, ciao, souvenirs, gelateria. The sky was getting cloudy and the square smelled of cigarette smoke. There were street magicians in red berets and random bursts of applause. By 4, half the Graham Greene and the bottle of Chianti on an empty stomach were gone and I wanted to go to a café to eat, but didn't want to give up the post I was leaning against. 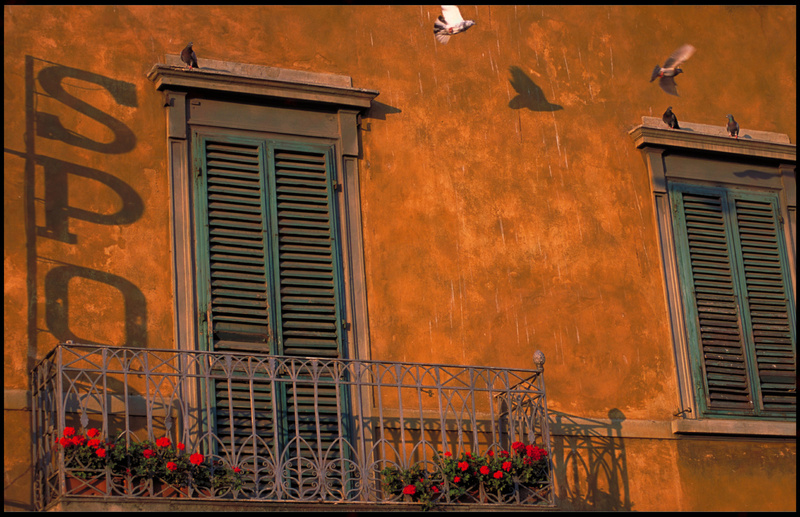 Drops of rain started to fall on my arms and the shadows were starting to thicken across the entire square. If I was a photographer, this was the time to start moving, right? I found a table outside a café and had dinner. I think my Italian was as good as ever. Does English + a little French + a bottle of Chianti + a pasta funghi outside in a light rain = Italian? I don't know, but it may be close. Traveling is full of small victories. The first time you go into a restaurant and the waitress understands you right away and doesn't speak English to you. Don't underestimate the importance of these things. 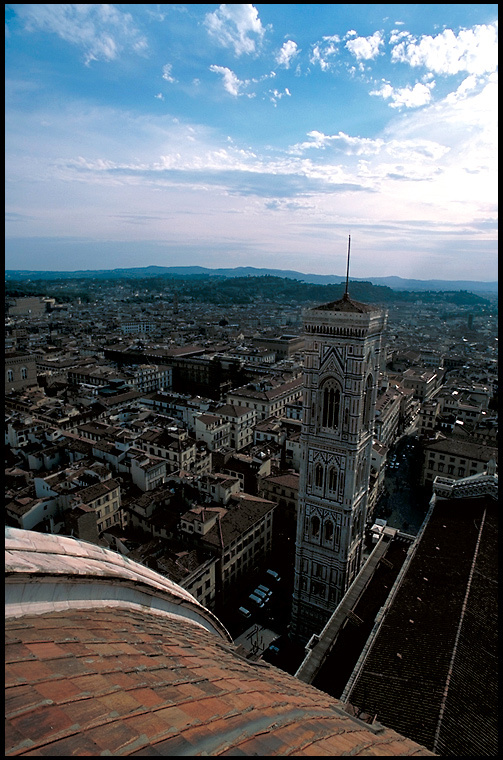 I went up to the top of the tower over the Piazza. I saw an Australian guy at the top wearing a Jeff Buckley t-shirt which is all you need to get an instant 'hello' out of me. A few minutes later, 2 girls from the University of Washington ("we're from the other Washington" one of them said when I answered their question about where I was from) asked me to take their photo. "Let me guess: You saw me with my camera and assumed I knew what I was doing?" I asked. "Uh no, I just knew you spoke English" the talkative one replied. She handed me her Canon EOS. Being a Nikon guy, I played around with it for a few minutes while they tried to hold smiles, probably regretting having asked me to click the shutter in the first place. Then I took the train back to Florence. tim photos are awesome. i just recently returned from barcelona, and especially enjoyed the photos from spain. photos r just great ,amazing .u ve an eye for beauty. Beautiful Images! A slice of heaven for sure! Marco Z. Great story ..... it brought back so many memories. Thank you.